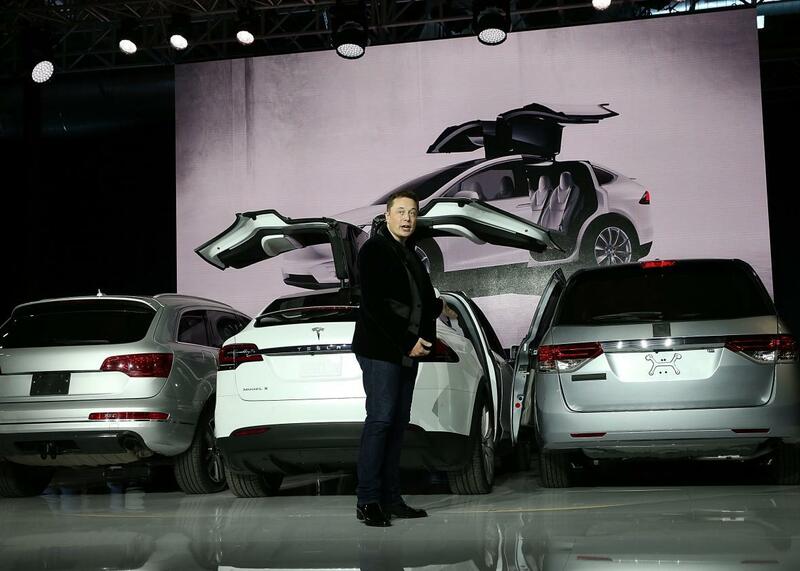 Tesla Model X launch: Elon Musk's one regret about the electric SUV. The top-end Model X seats 7, goes 0-to-60 in 3.2 seconds … and costs up to $142,000. As regrets go, it’s a rather self-flattering one, reminiscent of the unctuous job-seeker who cops to being “too much of a perfectionist” when asked about his greatest weakness. But in the Model X’s case, there’s actually something to it. Packed with wild features like autopilot mode, gullwing—er, “Falcon Wing”—doors, and a “bioweapon defense” button, the X is an awful lot of vehicle. It comfortably seats as many as seven, thanks to a fully functional third seating row. An oversized windshield offers panoramic views of road and sky. Like its sedan sibling, the Model S, the X has a front trunk where the engine would normally go. The battery instead lies beneath the floor, giving it a center of gravity that should make it immune to the rollover problems that have plagued SUVs past. And like the Model S, it boasts almost unbelievable performance for an object of its size, rocketing from zero to 60 in 3.9 seconds (or 3.2 in the optional “ludicrous” mode). All of which sounds fantastic, except for one thing: The Model X was never meant to require this much engineering, this much innovation. It was conceived as a sort of stopgap—a variant on the Model S that would buy Tesla some time to work toward its real goal: an all-new, third-generation sedan that normal people could afford. The Model X was originally supposed to ship way back in 2013, freeing the company to focus on the more important Model 3. And that was supposed to be possible because it was essentially just a Model S dressed up in an SUV’s clothing. 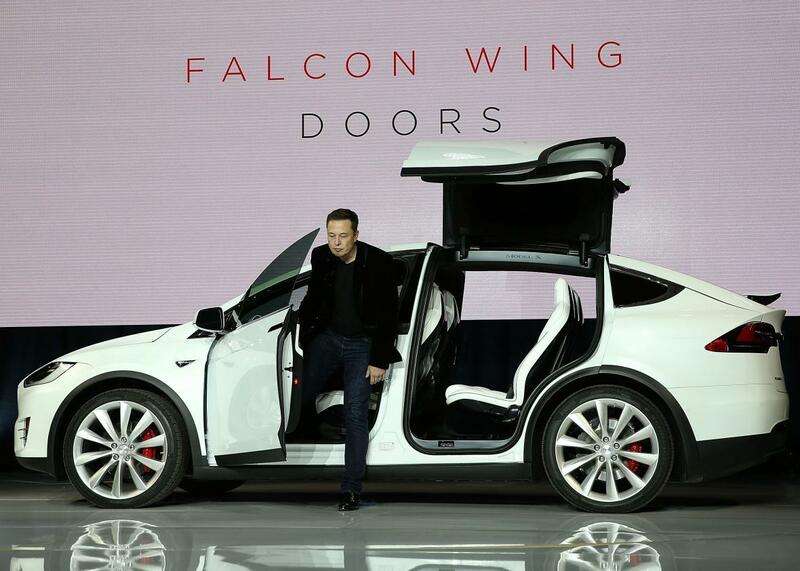 The Model X’s “Falcon Wing” doors lift up before spreading out, to navigate tight parking spots. Instead, it’s late 2015, and Tesla’s production of the Model X is just beginning. It sold the very first ones Tuesday night, but they were special “Founder Series” models built for a handful of A-list investors. The next batch will be the “Signature” editions that sell for $132,000. The company has not said when the sub-six-figure versions will be available, but suffice it to say you probably won’t get one this calendar year. When they are, they’re likely to cost as much as, if not a little more than, comparable trim lines of the Model S, which starts at $70,000. The upshot is that Tesla has spent three years building a vehicle that does nothing to broaden the market for its vehicles beyond the ultra-luxury segment. Sure, there are probably some buyers who will opt for a Model X over another top-end SUV, like a Range Rover, Porsche Cayenne, or Mercedes GL-Class. But many others will likely be committed Tesla buyers deciding between an X and an S.
Worse, the attention paid to the X’s groundbreaking design, gee-whiz gadgetry, and gobsmacking performance could solidify the popular image of Tesla’s vehicles as status symbols for our new tech overlords. It’s a fine image for a luxury brand. But it’s less than ideal for a mission-driven startup that has positioned itself as an underdog disruptor while relying heavily on government tax breaks. Musk has firmly maintained from the start that the company’s luxury vehicles are a mere means to another end: building the $35,000 Model 3 and taking electric vehicles mainstream. I don’t doubt that he’s sincere in that commitment, and I think the attacks on Tesla as a government-subsidized toy for the rich are off-base. But the Model X might have better served that goal had the company spent a little less time and money trying to justify its existence. Now, with all that said: The experience of driving a Tesla—with its ghostly quiet engine, sleek design, radically spacious interior, ground-hugging handling, and otherworldly acceleration—has a way of making one forget to quibble.